Florida-homeschooling.org provides Florida homeschooling information and support to all Florida families. We have legal and practical information for both new and experienced homeschoolers, as well as county-specific listings of evaluators, tutors, support groups, and private schools for homeschoolers. Your comments and suggestions are always welcome! A guide to homeschooling in Florida. 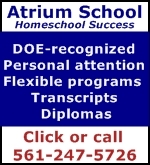 Information about homeschooling through a private school. Do you know how your child learns? Take the assessment to find out! Parents come to the decision to homeschool their children for myriad reasons. In our family, it was a combination of things, but I recall an early discussion with my husband in which I commented that I could certainly homeschool our kids for far less than what we were spending in private school tuition. Of course, the tuition savings was to be more than offset by the fact that I’d no longer be working (at least not in full-time, office position). Suddenly it became important to find low- and no-cost ways to homeschool my kids. Guess what? It was surprisingly easy to do. Here are some of the ways we saved money while still providing our children with a top-rate education. The Internet is Your Friend – My business background involved computer research, so I was very comfortable online even at a time (mid 1990’s) when internet usage was not as common as it is today. Today, there are numerous sites offering free materials to homeschoolers. Check out our list of free homeschooling materials. Sign up for FreeCycle – If you’re not familiar with this internet-based group whose mission is to “build a worldwide gifting movement that reduces waste, saves precious resources; eases the burden on our landfills while enabling our members to benefit from the strength of a larger community” then head on over to https://www.freecycle.org/. There are groups in every state and odds are excellent you can find a group in a city near yours. List the items you are willing to give away and post what you are looking for. Befriend Your Librarian – The library is an obvious choice of free books and videos, but can offer much more. Inter-library loaning policies allow you to borrow materials from other libraries. Look into the availability of free passes to local museums and attractions, which are offered by many libraries. Don’t overlook children’s programming at your library. Over the years, my kids participated in Science Club, Game Day, American Girl Club, Chess Club, and more. All of these provided educational and social enrichment and they were completely free. 4H Isn’t Just For Farmers – Are you still under the impression that 4H is a specialty program for kids in rural areas? Well, you’re wrong! Through 4H my kids learned about leadership – each club has a president, vice president, secretary and treasurer and follows Roberts’s Rules of Order – as well as about the specific area our club was studying. Offerings span the gamut from aerospace to workforce readiness. Check out the 4H Curriculum page. Then, view the 4H Home page to find (or start) a group near you. Join a Homeschool Support Group – Your local support group will provide many benefits, from co-op opportunities to field trips (at discounted, group rates) to park days. In addition, by connecting with other homeschooling families, you can join or create your own curriculum sharing (or swapping) group. See our list of Florida Homeschool Support Groups, sorted by county. Scout Around – Both Girl Scouts and Boy Scouts offer opportunities for your kids to learn skills in a wide variety of areas. Although both clubs have dues, these are typically minimal (I think we paid $3/meeting at my daughter’s Girl Scout club) and offer a good return on investment. Buy Wisely and Re-Use – I learned early on the value of maintaining purchased items in very good or like new condition. The easiest way to achieve this was to have my children write their answers in a notebook rather than in the pages of the purchased work- or text-book. This allowed me to re-use a single book with all three children or to swap or sell it once we were done. Sell What You Can’t Use – You won’t get rich this way, but you can make a few extra dollars by selling materials you no longer need and which cannot be swapped for something you do need. Many support groups host used curriculum sales at the end of the school year. No luck there? Try selling on Vegsource’s Homeschool Swap Boards. These boards see a lot of traffic and I’ve had good success both buying and selling there. I recommend setting up a paypal account so you have some protection in the event of an unscrupulous seller. Have a Kindle (or other e-reader)— There are many books that are out of copyright as well as free content from many publishers. Get started by looking through 2,500,000 titles at Internet Archive (which also includes free software, audio and more), Amazon (MOBI format) and Open Library (over 1,000,000 titles). Other sources include Project Gutenberg and Google Books. Don’t have an e-reader? Download a free app! Check the app store for your device to find the best one for you. Neither a Borrower Nor a Lender Be – Thrifty homeschoolers know to ignore this adage. If you have an e-reader, you can borrow and lend titles for free and it’s totally legal. Check out Booklending.com. Finally, don’t overlook your public library. Many libraries now offer e-books for loan to members. Watch a Movie or Some TV – If you haven’t discovered the Teach With Movies web site, you are missing out. The site offers lesson plans in English, Social Studies and the Sciences for movies and films. Access six lesson plans free, then pay just $11.99 for a year’s subscription. Also check out the History.com classroom, which offers free study guides for History Channel shows (which air at 6am Mondays – a recorder is a good idea! ), or Discovery Channel’s teacher resources, which are conveniently organized by grade level. 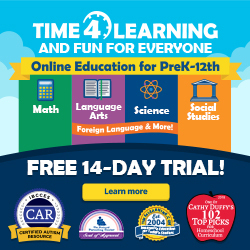 Take Classes Online – Many states offer online (virtual) schools that provide free courses to all students in the state, regardless whether they are educated at home, at a private school, or in public school. In Florida, the Florida Virtual School offers a wide variety of classes, completely free, for grades 6-12. These courses are aligned with the Sunshine State Standards. Other, less formal, sources of online classes include the Kahn Academy, MIT, and Harvard. Get a Discount Card — Barnes and Noble, Books a Million and other retailers offer discounts to homeschoolers. You may also want to consider joining the Homeschool Buyers Co-Op. With a little research and ingenuity, you’ll be on your way to homeschooling for free… or pretty darn close to it!